Third of six children born to Francesco Matteo and Carolina Mozzoni Frosconi. Eugenia's mother died when the girl was three, her father moved with some of the children to Genoa, Italy to find work, and Eugenia was raised in Milan by her pious aunt Marietta Anselmi. The family reunited in Genoa in 1852, but Eugenia's father died in March 1855, and she moved in with her pious relatives Luigi and Elisa Ravasco (and their ten children). Eugenia grew up in a time when opposition to the Church and the clergy was on the rise, and Freemasons actively opposed the Catholic hierarchy. Her family, however, including her extended one, were open about their faith, and active in their parish life; Eugenia made her First Communion and Confirmation on 21 June 1855, and began a habit of frequent prayer. In December 1862, uncle Luigi died, and Eugenia took over care of the family. The pious home continued in turmoil as her brother, Ambrose, join the anti-clerical forces. Her remaining family wanted Eugenia to marry, but she felt a call to religious life, and during a mission on 31 May 1863, the young woman felt a strong desire to enter a vocation dedicated to the Sacred Heart of Jesus. With the help of her spiritual director she began teaching catechism and helping poor girls, especially those who lived on the street. Other young women joined in her work, and on 6 December 1868, with the help of Canon Magnasco, she founded the Sisters of the Sacred Hearts of Jesus and Mary (Ravasco Institute) to teach catechism and open secular schools for the poor. Mother Eugenia served the rest of her life as first Supererior to the Congregation and worked with great courage in the face of growing anti-clerical persecution in her region. She travelled Italy, France and Switzerland to start new communities, teach, give direction to new sisters, and correct the anti-Catholic press. The Congregation received diocesan approval in 1882, the first group of sisters made their perpetual profession in 1884, and they received papal approval in 1909. Today the Sisters work in Albania, Italy, Switzerland, Argentina, Bolivia, Chile, Colombia, Mexico, Paraguay, Venezuela, Africa and the Philippines in schools, parishes and missions, dedicated to youth, the poor, and promoting the dignity of women. Eldest of ten children born to Gasparo Boccardo and Giuseppina Malerba; his was a pious family - he was baptized at one day of age, three of his brothers became priests, one of them Blessed Luigi Boccardo. He studied with the Barnabites, graduating from their high school in 1864, and then the diocesan seminary. Ordained on 3 June 1871 in the archdiocese of Turin, Italy. Giovanni was drawn to religious life, but was assigned to work in seminary, first teaching and then becoming the spiritual director of young seminarians in Chieri, Italy in 1873 and then in Turin. Received a doctorate in theology on 1 February 1877. Honorary canon of the church of Santa Maria della Scala in Chieri. Friend of Saint John Bosco, Saint Leonard Murialdo, and Blessed Joseph Allamano. Parish priest in Pancalieri, Italy in 1882 where he spent the rest of his life as a beloved pastor, caring especially for the sick and the poor, filling in at other parishes, ensuring religious education of children, and maintaining a prison ministry. Working with the sick during a cholera epidemic in 1884 impressed on Giovanni the need for better medical care for the poor; he founded a hospice for the impoverished sick on 6 November 1884. Founded the Poor Daughters of Saint Cajetan with a mission to care for the poor sick, the long term sick, sick priests, the elderly and the neglected; their work continues today in Italy, Brazil, Benin and Argentina. In 1911 Father Giovanni was stricken with a form of paralysis that eventually led to his reluctantly giving up all areas of ministry his final two years. His private writings on matters spiritual runs to 44 volumes. Daughter of Prince Odo Colonna of Palestrina, Italy. Her parents died when Margaret was young, and she had to care for her two brothers, the youngest of whom grew to be Cardinal James Colonna in 1278. Having refused a marriage offer by the chief magistrate of Rome, Margaret retired from the world, and turned the family castle near Palestrina into a retreat where she passed her time in piety and penance. Noted for charity to the poor, which was more than once miraculously rewarded. Through the influence of her brother the cardinal, Margaret obtained papal approval for a community of Urbanist Poor Clares at her castle, where she became superioress. Suffered her last seven years from a terribly painful ulcer, which she used as a chance to demonstrate resignation. After her death, her community move to the convent of San Silvestro in Capite in Rome, Italy, from where they were driven to the convent of Santa Cecilia in Trastevere in Rome. Son of Constantius; little else is known of his early life. Chosen 26th pope in 269. Believed to have given sanction to the ancient practice of celebrating anniversary Masses at the graves of martyrs. First to condemn the heresy spread by Paul of Samosata which taught that Christ was a mere man used as a puppet by God. Suffered through the persecutions of Aurelian, working personally to bring non-Christians to the faith. 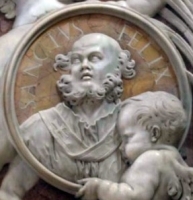 Some old records indicate that he was a martyr, the reason for his inclusion on early calendars of the saints, but they were apparently in error, confusing him with another Felix of the era. Born to a wealthy and pious family, Anysia lived private vows of chastity and poverty, praying and using her wealth to help the poor. One day a Roman soldier accosted her as she was on her way to services. When he discovered she was a Christian, possibly she crossed herself in fear, he beat her, and said was going to drag her to a pagan temple and force her to make a sacrifice. 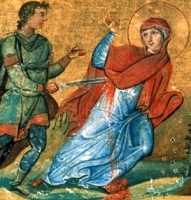 When he tore off the veil she habitually wore as a sign of her chastity, she spit in his face; he murdered her. Pious youth. Deacon. Reluctant bishop of Canne, Italy at age 30. Legend says that when he travelled his diocese, an eagle flew above him to shelter him from the weather. Born to the Frankish nobility, he was educated in Beauvais, France. Worked with Saint Eloi. Part of the court of King Dagobert I. Married. Father. Advisor to King Clovis II. With his wife's consent, he retired to the abbey of Pentale on the Seine in France. Abbot at Pentale, but he was so severe with his monks that a group tried to kill him. He resigned, then retired to become a hermit in a cave near the abbey. Founded Flay Abbey between Beauvais and Rouen in France in 655; it was later renamed Saint-Germer in his honour. 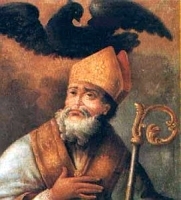 Related to Saint Eustachius of Tours and Saint Volusianus of Tours. Bishop of Tours, France for 30 years. Restored ecclesiastical discipline in his suffragan dioceses to the point that unworthy priests were removed from service. Built churches and monasteries. Bishop of Thessalonica, Macedonia in 383, he was involved in the political and religious struggles of the time. Vicar apostolic of Illyricum. Defended Saint John Chrysostom during that saint's exile. Highly regarded by his peers, Saint John Chrysostom, Saint Ambrose of Milan, Pope Saint Innocent I, and Pope Saint Leo the Great. Member of the Premonstratensians. Canon of the Norbertine monastery of Wedinghausen in Arnsberg, Germany. Theological writer. Benedictine Cistercian monk and spiritual student of Saint Bernard at Clairvaux Abbey. Sent by Bernard to found and govern a Cistercian abbey of Vaucelles, diocese of Cambrai, France. Bishop of Forconium (modern Aquila), Abruzzi region, Italy. Noted for his excellent administrative skills, but no details about the man have survived. Monk. 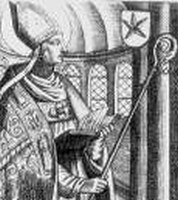 Archbishop of Esztergom, Hungary in 1002. Worked with Saint Stephen to evangelize the Hungarian people. One of the first bishops of the diocese of Ravenna, Italy. A group of Christians martyred in the unrest caused by Monophysite heretics. We know the names for five of them - Appian, Donatus, Honorius, Mansuetus and Severus. A group of Christians martyred together, date unknown. The only details to have survived are the names - Cletus, Florentius, Papinianus, Paul, Serenusa and Stephen. A group of Christians martyred in the persecutions of Diocletian - Exuperantius, Marcellus, Sabinus and Venustian.